In addition to watching television and movies in these North Myrtle Beach vacation rentals you can get online. There is high-speed Internet access in the North Myrtle Beach rentals at Crescent Towers West. So bring along your laptop computer and take advantage of the Internet access during your beach vacation at this North Myrtle Beach resort. Furthermore, these North Myrtle Beach condominiums are furnished with a washing machine and clothes dryer. All you need to provide is your favorite laundry detergent. Having a washer/dryer unit at your fingertips is a blessing when your family plays hard and gets sweaty enjoying the North Myrtle Beach amusements and attractions. Easily do a load of laundry in the privacy of your North Myrtle Beach condo and then walk across the street to the beach. You do not have to worry about getting your laundry out of the public washing machine so another guest can use it. When these appliances are in your private North Myrtle Beach vacation rental you can tackle laundry the same way you do at home. 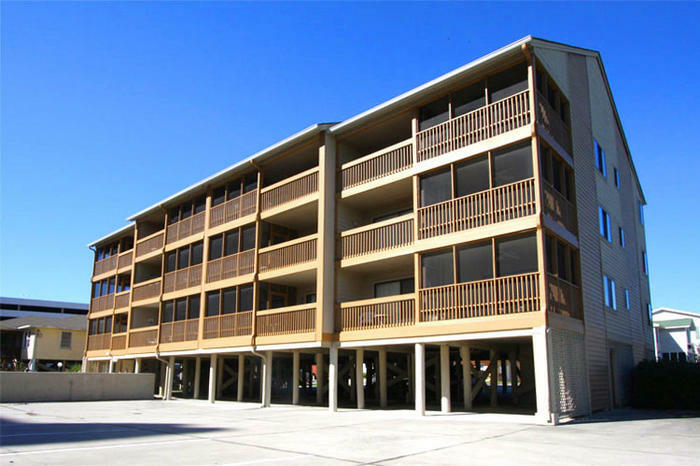 There is a private balcony off of the living room in each of these North Myrtle Beach rentals. The balconies in these North Myrtle Beach condo rentals are furnished so you may comfortably sit and enjoy the views of the swimming pool and feel the breezes gently blowing in from the Atlantic Ocean. It is rather easy to spend the day on the balcony where almost anything you do there will rejuvenate you. Slip down to the pool where lounge chairs and nice landscaping beckon your family to spend the day. Whether it is the refreshing waters of the swimming pool that you most seek or the idea of getting a good suntan while enjoying the comfort of a chaise lounge, the pool deck at Crescent Towers West is the perfect spot for both activities. The sparkling blue swimming pool at this North Myrtle Beach resort faces Ocean Boulevard and is just across the street from the beachfront. When you spend your North Myrtle Beach vacation at Crescent Towers West you will be closely located to championship golf courses, fishing, boat tours, shopping, dining and more. There are more than 100 golf courses in the Myrtle Beach area. Many are championship golf courses designed by golf’s greatest architects and your favorite PGA players. Get a tee time for an award-winning golf course in the Myrtle Beach area and admire the scenery of a manicured golf course while challenging your skills on the course’s lay out. When you stay in North Myrtle Beach you can fish from piers, shore, banks, personal boats, head boats, deep-sea charters and kayaks. There are so many ways to reel in a fish in the North Myrtle Beach area and you don’t even have to bring your own gear. Fishing gear rentals are available throughout town. Hop onto a boat and tour the Intracoastal Waterway, the salt marsh and the Atlantic Ocean coastline. There are dolphin watch cruises and speed boat expeditions and you can even take a pontoon boat ride during your North Myrtle Beach vacation. Shopping is everywhere and includes charming boutiques, eclectic antique stores, outlet malls and flea markets. The area has name-brand gifts and one-of-a-kind fashions for you to take home with you. There are more than 1,500 restaurants in the Myrtle Beach area and seafood is readily available. So bring your appetite for shrimp, grouper, flounder, blue crabs, oysters and crab legs and your needs will be met during this North Myrtle Beach vacation. All of these things, plus live entertainment theatres, are only minutes away from Crescent Towers West. Elliott Beach Rentals is not affiliated with onsite management or the HOA of Crescent Towers West.